Sharing a good news from Krispy Kreme Cagayan de Oro Branches.
" Maayong adlaw. 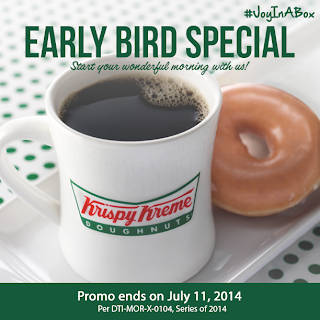 There is #JoyInABox waiting for you Early Birds! From opening until 12 noon, buy any large drip coffee and get an Original Glazed doughnut on us! Head to Krispy Kreme Limketkai and Krispy Kreme Centrio to avail of this special offer. Promo ends on July 11, 2014. " I'll make this my morning ritual before I head on to my events. See you later Krispy Kreme and in the mornings to come.